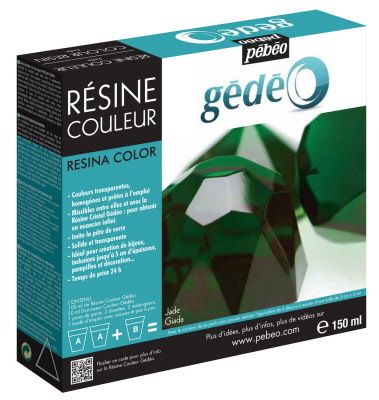 Gedeo resins manufactured by Pebeo allow the crafter or jewellery maker to create a large variety of attractive objects. Available as two-component epoxy resin systems these products set solid in 12-24 hours. 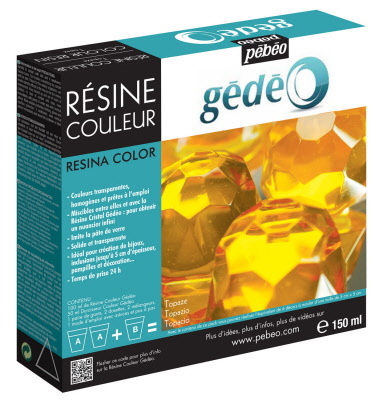 Gedeo Colour Resin is deal for creating jewellery items, decorative drops, inclusions and mouldings. See instructional video. Ready to use homogeneous and transparent colours. Imitates glass paste. Solid and transparent. Ideal for creating jewellery, decorative drops, inclusions up to 5cm thick, etc. Drying time 24 hours. Contents: 150ml Topaz Colour Resin (100ml colour resin and 50ml colour hardener), protective gloves, 2 measures, 2 mixers, user guide with tips and step-by-step instructions. Contents: 150ml Jade Colour Resin (100ml colour resin and 50ml colour hardener), protective gloves, 2 measures, 2 mixers, user guide with tips and step-by-step instructions. Use Moulding Alginate to make moulds of delicate objects or the human body. High quality casting moulds from Pebeo and Staedtler.